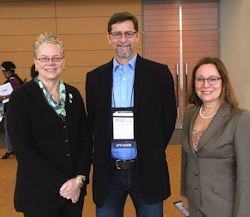 Linda Arpino and other Authors Present at Boston Food and Nutrition Conference: Evidence Based Pediatric Weight Management Nutrition Guidelines. Linda Arpino is an elected Delegate for the Vegetarian Dietetics Practice Group at the Academy of Nutrition and Dietetics, gaining strides as a leader in supporting the evidence based research plant-based nutrient benefits for chronic disease prevention. 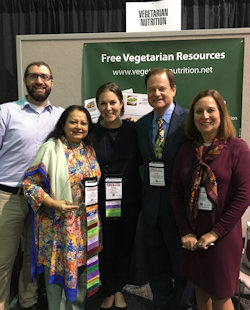 Linda Arpino, Vegetarian DPG Delegate at the Academy of Food and Nutrition Conference in Boston with the Vegetarian Practice Group members. Linda Arpino has helped thousands of people both in the US and globally. At every stage of life she has assisted people improve their health through nutrition, active lifestyle, and positive outlook. As a practicing registered dietitian nutritionist and certified dietitian nutritionist she advocates health through lifestyle choice. In pediatric and adolescent nutrition she has helped thousands of families create habits including healthy meals and snacks which sustain life- long health. She is recognized for her expertise in weight management, dyslipidemia's and neurological disorders by pediatricians and other health care professionals. She serves on evidenced based analysis committees of the Academy of Nutrition and Dietetics, devoted to analyzing credible research to provide professional guidelines in medical nutrition therapy. Linda completed a fellowship in Leadership in Education of Neurological Disorders and wrote a curriculum entitled "Recipes for Health for Young Adults with Autistic Spectrum Disorders" which helps teach nutrition through food preparation. It has proven to be a success. She also authored Eat Fit, Be Fit: Health and Weight Management Solutions, a lifestyle guide, with over 300 fast delicious recipes that spells out portion control, increasing intake of plant based foods designed for low glycemic load and has diabetic exchanges. As an expert on polycystic ovarian syndrome she has published peer reviewed articles for the Academy of Nutrition and Dietetics. She is regularly quoted and contributes to magazines, newspapers, websites, journals and books including the ADA cookbook,Eating Across America and Teen Vogue, Shape, General Mills Nutrition Web site, Men's Magazine, Newsday, Parent Magazine, and D-Life. She also wrote a 10-week workbook entitled Recipes for Health: Cooking Skills course for High Functioning Adults with Autism. In media, Linda is sought after as a nutrition expert and speaker to organizations, corporations, on television including NBC and numerous radio networks. She videotaped with former President Clinton as an Academy of Nutrition and Dietetics representative for the Clinton Foundations Alliance for Healthier Generation Initiative and with the New York Chapter of the American Academy of Pediatrics on Childhood Obesity. In stores, such as Bloomingdales and Whole Foods she has conducted culinary events which focuses on plant based cooking for health. Linda is a savvy motivational speaker not only for media, but worksites and organizations, but in spas, healing centers, and fund raisers. For registered dietitians, medical associations and societies she speaks on numerous topics. such as sport nutrition, vegetarian and environmental nutrition choices, weight management, dyslipidemia, neurological disorders, and plant based eating for health risk reduction, using evidenced based nutrition interventions. The Life Focus Nutrition Centers was created by Linda to helped people of diverse ethnic take backgrounds take charge of their health. 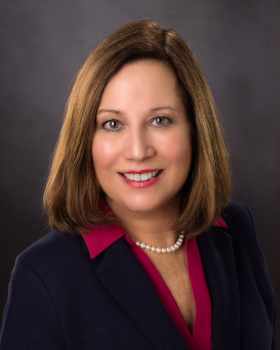 With degrees in nutrition from Syracuse University and masters at New York University, Linda Arpino has advanced training certifications in weight management for children, teens and adults. Linda is an active member and leader in Academy of Nutrition and Dietetics (AND). She currently serves a on the AND Evidenced Based Analysis Work groups and has been nutrition expert content reviewer for the Academy of Pediatrics weight management tool kit for physicians. She is a member of the Connecticut Academy of Nutriton and Dietetics Board and she is state coordinator of the Vegetarian practice group. She is a member of the Sports and Cardiovascular Nutrition, Nutrition Entrepreneurs, Weight Management and Pediatric Nutrition, AND Practice groups. 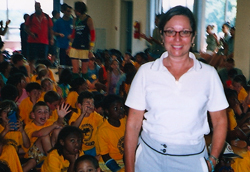 Linda has served twice as president of The Westchester Rockland Dietetic Association. 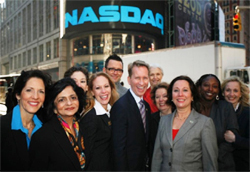 She received national presidential honor as 2007 Business Women of the Year. Linda is a professional who finds satisfaction in helping people create healthy lifestyle changes and preserve the environment. © Life Focus Nutrition LLC. All material in this Website is provided for educational purposes only. Consult your own physician regarding the applicability of any opinions or recommendations with respect to your symptoms or medical condition. All rights reserved.